Vacation rental villa. 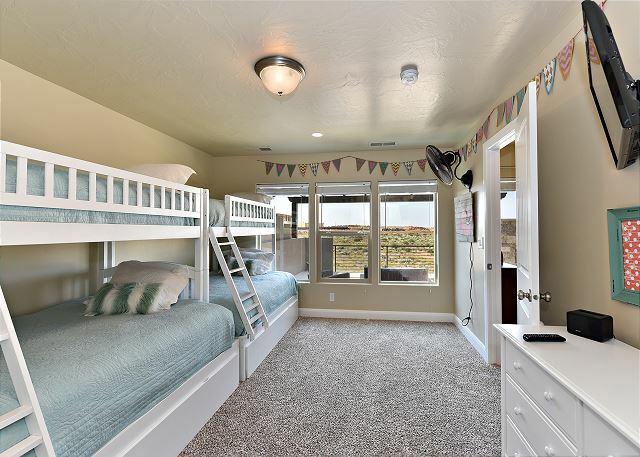 Sleeps 16, 4 bedrooms, 3.5 bathrooms. No pets allowed. Welcome to our home, Greenwind. Our 2692 square foot luxury villa includes 4 bedrooms, 3.5 bathrooms and has a maximum occupancy of 16 people. View of the patio furniture and pergola. Enjoy the weather under the pergola while sitting in our comfortable patio furniture. Back patio table which comfortably seats up to 6 people. 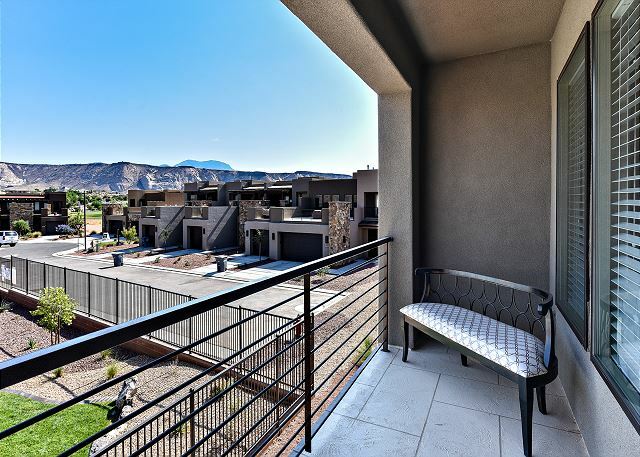 Relax in privacy and take in the amazing views St. George has to offer. Back Patio with view of pool and patio area. The living room is conveniently adjacent to the kitchen. There is also access to the back patio which has a BBQ grille suitable for all your favorite BBQ dishes. 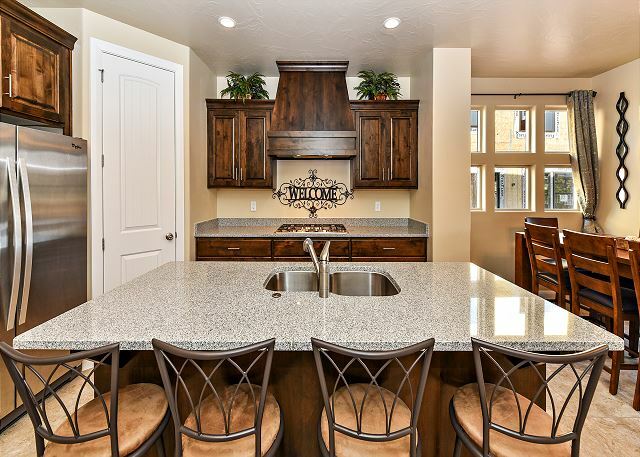 The Kitchen Island comfortably seats 4 adults and creates a great space for serving and preparing meals. 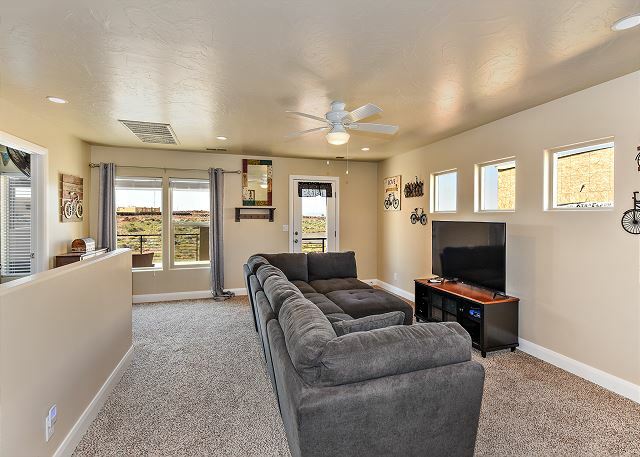 The Living Room is located adjacent to the dining room and is the perfect place to relax and watch your favorite movie or TV program. 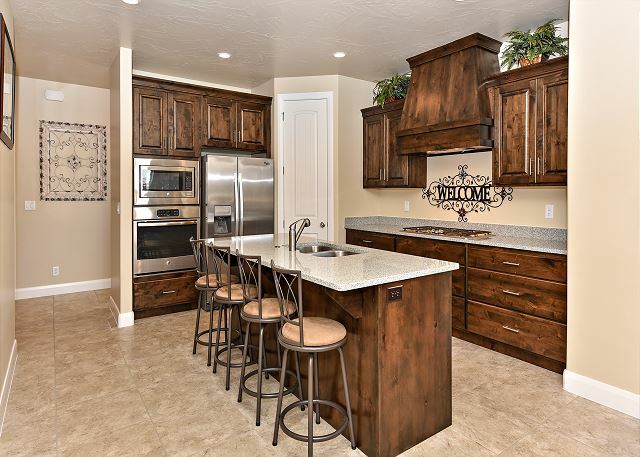 The kitchen is fully stocked with all the dishes, cookware, baking pans, and cutlery you will need for meal preparations and includes stainless steel appliances and granite counter tops. With an open and spacious floor plan, the Dining Room and Kitchen can accommodate meal preparations for groups large or small. The Master bedroom is furnished with a plush King bed, private satellite TV, and walk-in closet. This Master bedroom has all the elements needed to relax after a long day. With a gorgeous view right out the window, it is the perfect way to start and end your day. 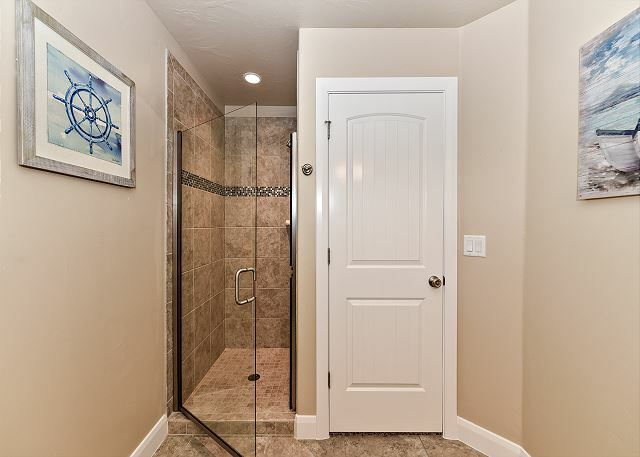 The Master Bathroom includes his and her sinks, walk-in shower, and full-size bathtub. 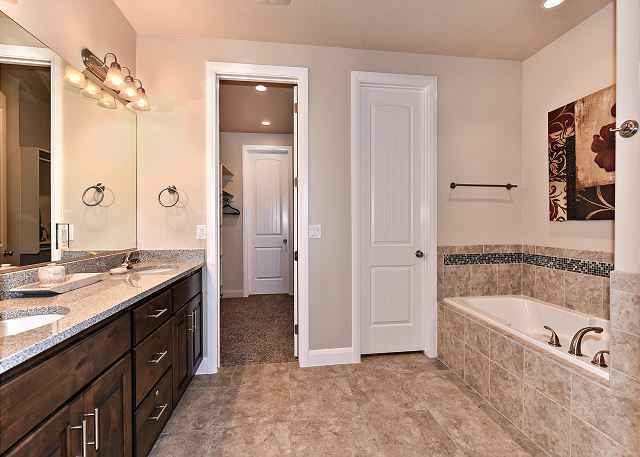 The master bathroom that is adjacent to the master bedroom is large and luxurious. 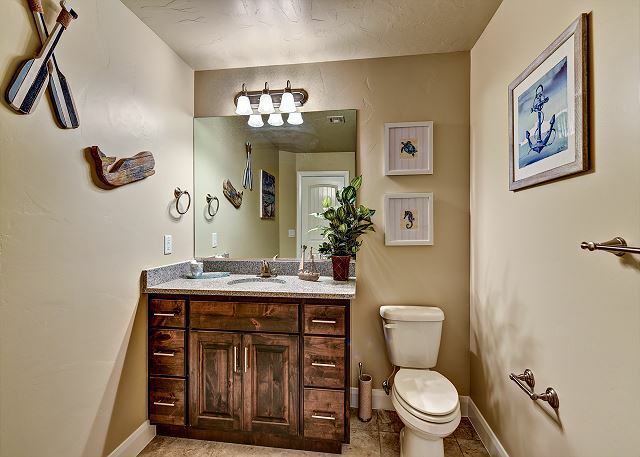 With his and her sinks, toilet, vanity, walk-in shower, large bathtub and a large walk-in closet. 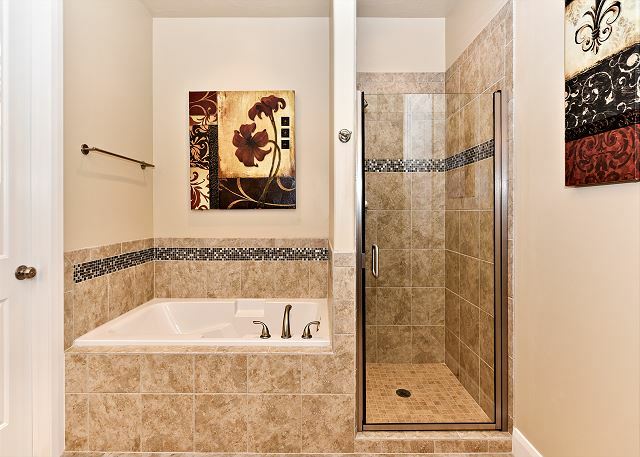 Let your worries soak away while relaxing in the large Master Bathtub and spacious walk-in shower. 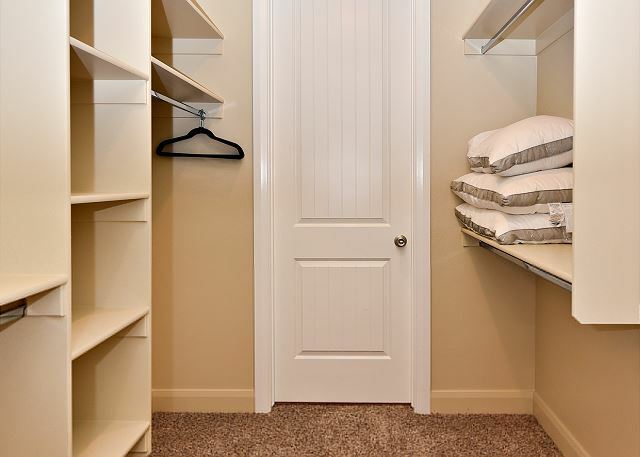 Enjoy walking into this large and spacious closet located next to the Master Bathroom. Bedroom 2 includes King bed, private satellite TV, private access to the deck overlooking the pool. Bathroom 2 showing beautiful vanity, sink and toilet. Bathroom 2 includes a walk-in shower and closet. 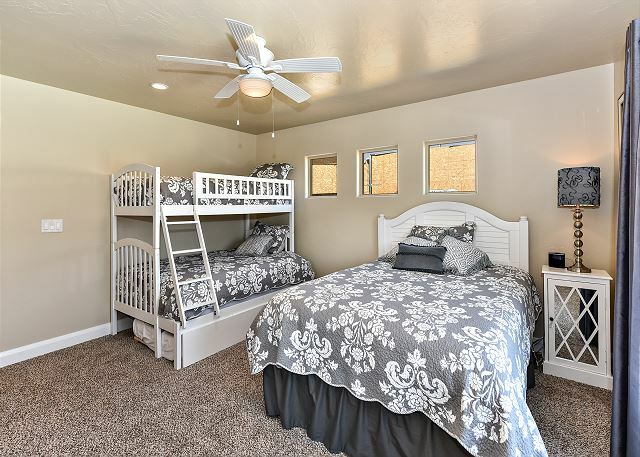 Bedroom 3 includes a Queen bed with Twin over Full Bunk beds and twin trundle bed. Located downstairs this half bath includes toilet, sink, and vanity. 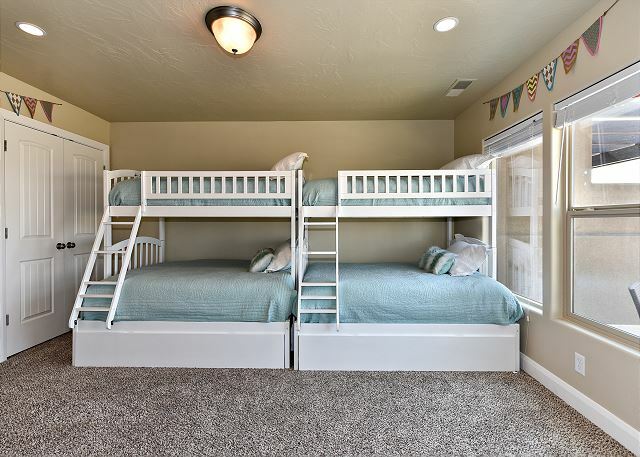 Bedroom 4 is a large bedroom with two twin over full bunk beds. Bedroom 4 showing view of the front patio. Bathroom 4 includes a tub/shower combo, sink, toilet, and vanity. 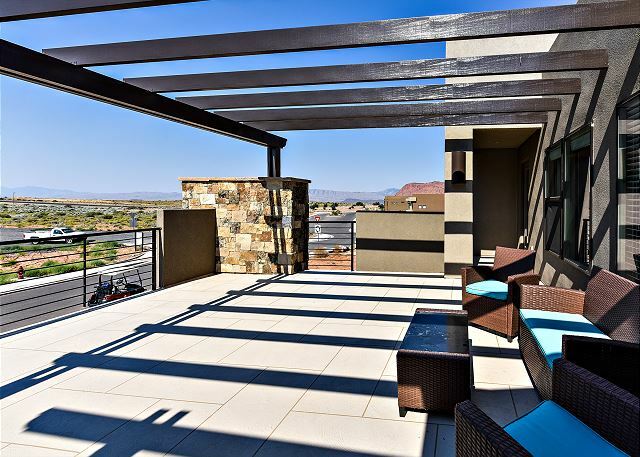 Welcome to Greenwind located at The Ledges in St. George. 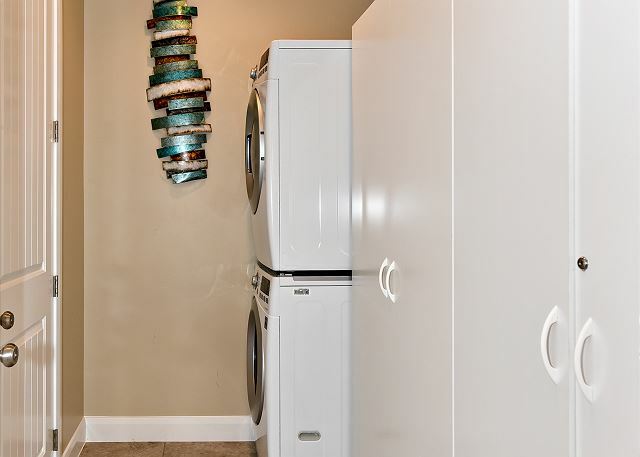 Laundry Room including washer, dryer, and plenty of storage space. 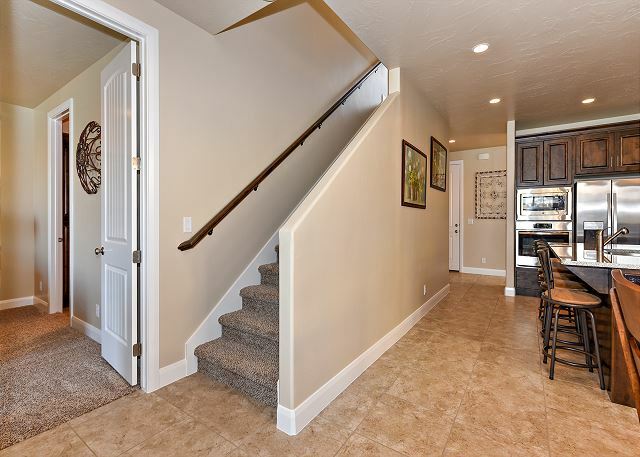 Stairs leading to 3 bedrooms and family room upstairs. 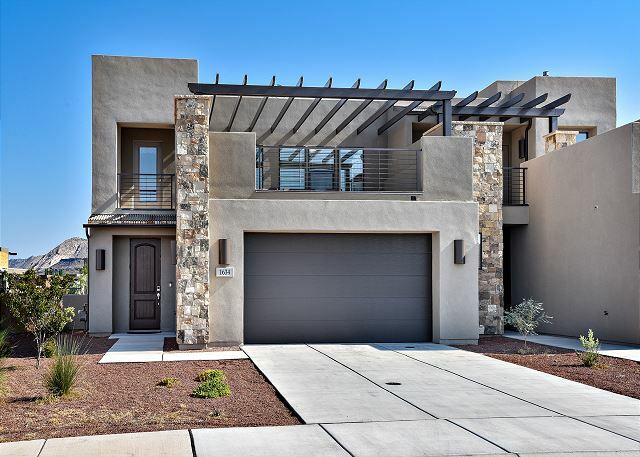 Greenwind is a 2692 sq foot, 4 bedroom luxury villa that is located directly next to the neighborhood amenities. 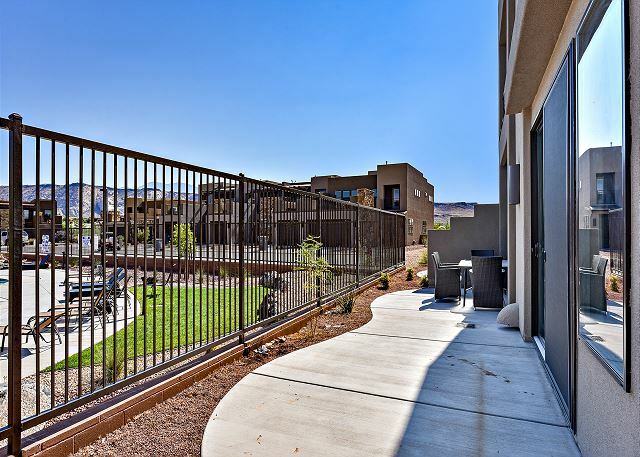 Our home is furnished with all the upgrades you could ask for, including large flat-screen Smart HDTV's, granite counter-tops, as well as stainless steel appliances. 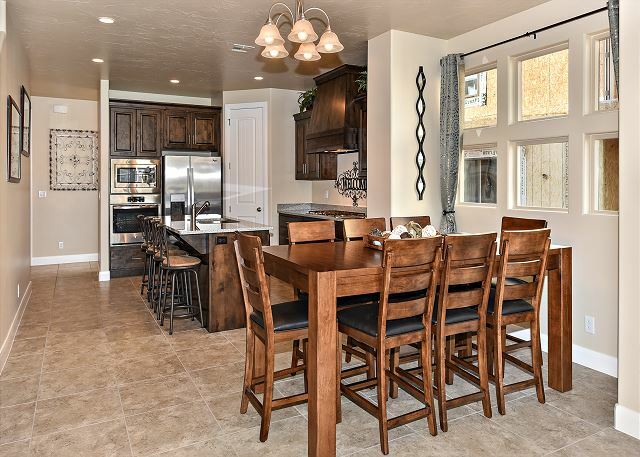 The floor-plan is spacious and setup with to accommodate golf groups and families. 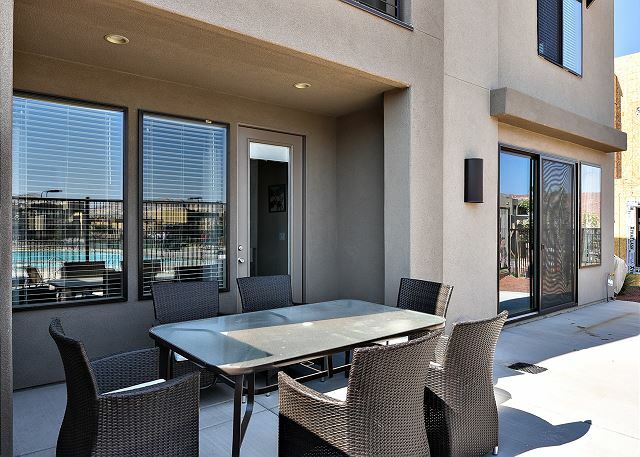 Whether you're looking to relax or spend your day enjoying the surrounding landscapes, you can rest comfortably in the contemporary style bedrooms, partially covered outdoor patio with outdoor lighting, or spend time with family and friends in one of the two family/recreation rooms. Can Sleep Up To 16 People! Great place to stay and great golf weekend. We had plenty of room the beds were very comfortable everything we needed in the kitchen. We would like to stay there again. Darlene, Thank you for choosing to stay with us at The Ledges. We appreciate you taking the time to give us such a great review. We are happy to hear that you loved the home and the amenities we have to offer. We look forward to helping you again in the future. Thank you, from all of us at The Ledges. There were 10 of us enjoying the pool and pickle ball and the unit was big enough not to feel cramped. We were so close to Snow Canyon and our favourite restaurant, Xetava. A great holiday and we’ll be back. Staff very helpful and professional..
Donna, Thank you for choosing to stay with us at The Ledges. We appreciate you taking the time to give us such a great review. 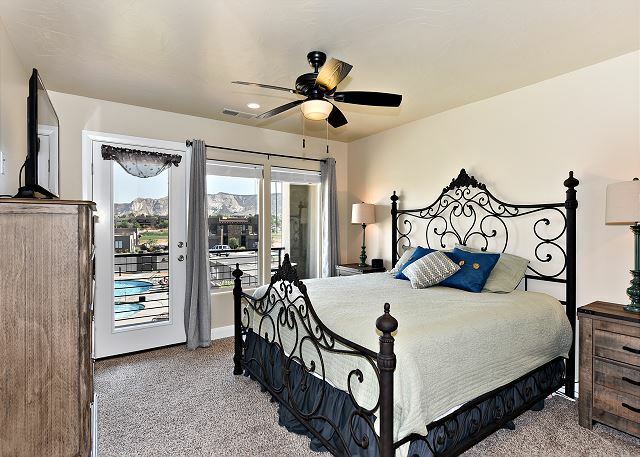 We are happy to hear that you loved the home and the amenities we have to offer. We look forward to helping you again in the future. Thank you, from all of us at The Ledges. Very nice, quiet place for your whole group!! This was my first time using a service like this and everything was professional and smooth. 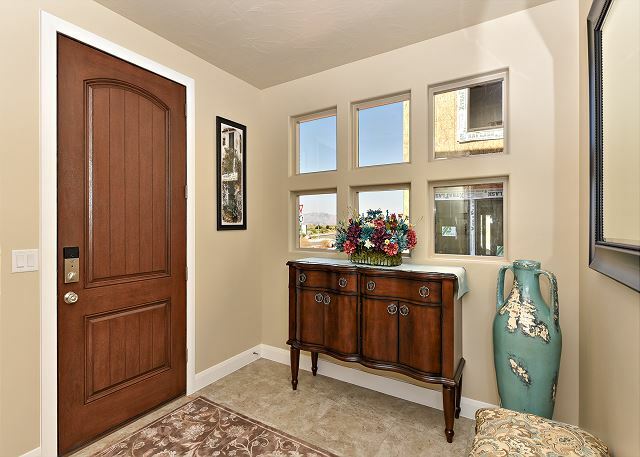 The home is in amazing condition and everything it has to offer is right at your fingertips. Will definitely use this location again! Joe, Thank you for choosing to stay with us at The Ledges. We appreciate you taking the time to give us such a great review. 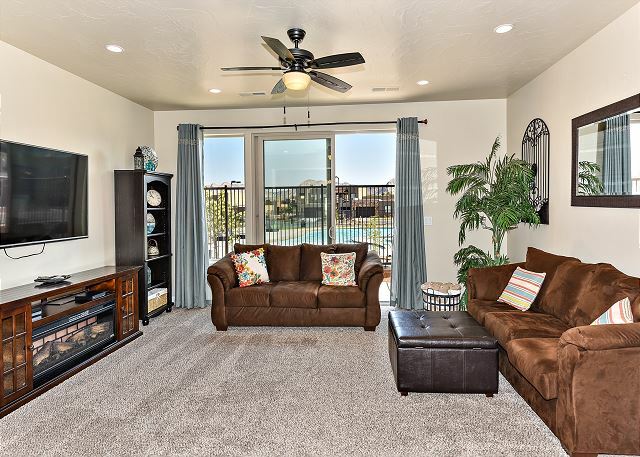 We are happy to hear that you loved the home and the amenities we have to offer. We look forward to helping you again in the future. Thank you, from all of us at The Ledges. We loved this condo. Very clean, decorated nice, great pool with easy access from our condo and ample room for everyone. We had multiple families staying and it never felt crowded. The only draw back was we ran out of some of the supplies like garbage bags. We were unsure how to contact the office to ask for more and it was Thanksgiving so when we tried there was no answer, but was a holiday. We ended up having to buy some. Then on the day after Thanksgiving we were able to contact them and found out that yes, they provide the supplies. The stay was fabulous and we would love to stay again! Christine, Thank you for choosing to stay with us at The Ledges. We appreciate you taking the time to review us. 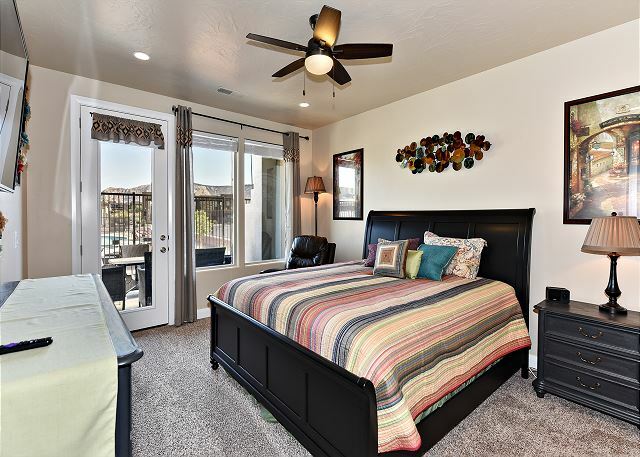 We are happy to hear that you loved the home and the amenities we have to offer. I apologize that you were not able to get a hold of anyone. Keep in mind when you stay with us again that we do put our cell phone numbers in the correspondence and you can call or text any one of us at anytime. We look forward to helping you again in the future. Thank you, from all of us at The Ledges. 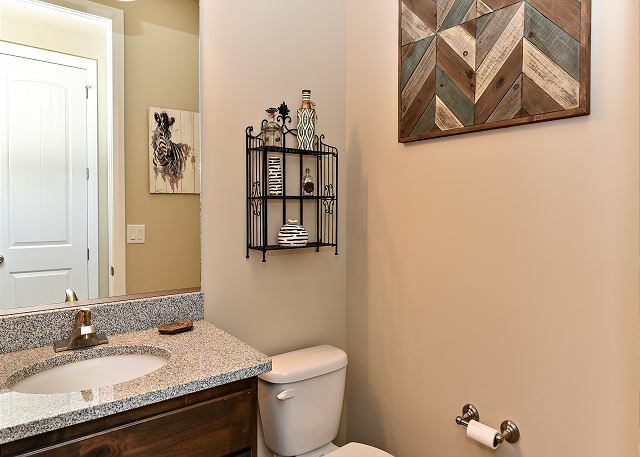 Bedrooms and baths are well appointed. Very comfortable. Common living area could use improvement - no lamps in general area. Only available light is overhead and those are not on dimmers - so super bright or dark. Fun view of pool. There are pool noises, so make sure you like that sort of thing if you stay in this unit. Lori, Thank you for choosing to stay with us at The Ledges. We appreciate you taking the time to review us and are happy to hear that you loved the home and enjoyed the amenities we have to offer. We will let the owner know about your suggestions on the lighting. We look forward to helping you again in the future. Thank you, from all of us at The Ledges. We love our vacation staying in this home! 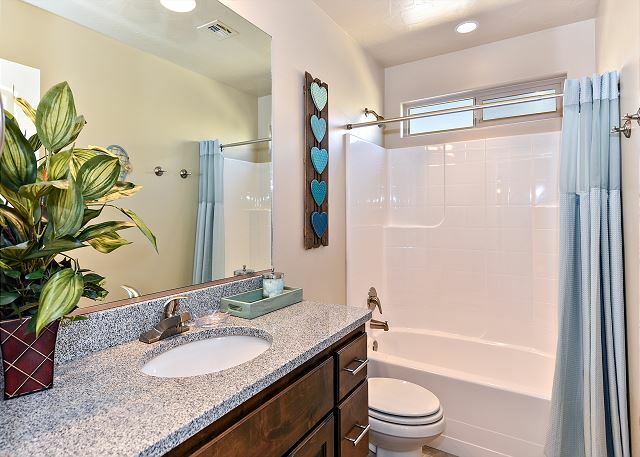 It was so beautifully decorated, very clean, great amenities with the pool,huge hot tub and pickleball courts just steps away! We had two families equaling 13 people and everyone had a comfortable bed, besides the large gathering area that gave everyone plenty of space to spread out. I would stay here again in a heart beat!!! One more big bonus, It was about a 5 min drive to snow canyon, where we spent one of our days exploring! Jeremy, Thank you for choosing to stay with us at The Ledges. We appreciate you taking the time to review us and are happy to hear that you loved the home and enjoyed the amenities we have to offer. We look forward to helping you again in the future. Thank you, from all of us at The Ledges. My family and I stayed here for two nights for a vacation wedding that was at the Ledges Golf Club/Course one weekend. The moment we stepped foot in the house, we were in love! The home was beautiful and cozy. The teens loved their room and the adults loved the living/family room and the kitchen. The pool was right in the back of the house, a close walking distance :) It was a great two nights at the Greenwind Rental. We highly recommend staying at this house. We look forward to coming here again in the future. Annalene, Thank you for choosing to stay with us at The Ledges. We appreciate you taking the time to review us and are happy to hear that you loved the home and enjoyed your stay. We look forward to helping you in the future. Thank you, from all of us at The Ledges. Overall was amazing. This is a beautiful home in a great community. Close to amenities and recreation. Loretta, Thank you for choosing to stay with us at The Ledges. We appreciate you taking the time to review us and are happy to hear that you were able to enjoy your stay. We look forward to helping you again in the future. Thank you, from all of us at The Ledges. This was such great accommodations for our family reunion!! Adreana, Thank you for choosing to stay with us at The Ledges. We appreciate you taking the time to review us and are happy to hear that you enjoyed your stay. We look forward to helping you again in the future. Thank you, from all of us at The Ledges. 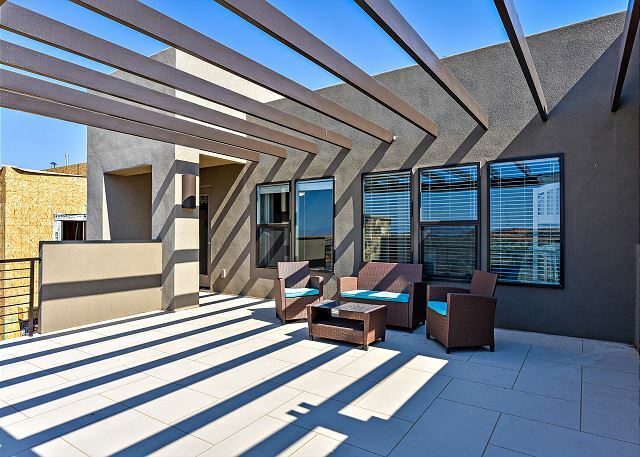 Beautiful condo that actually sleeps 16!!! This is a beautiful, clean and roomy condo. We could open our door to hear the kids at the pool, but no traffic passed our door. There are actual beds for 16 people. Cable TV, Roku and Wifi included. Several gathering areas, well-stocked kitchen. Our family had a ball!!! My kids said the only thing they recommend is more towel hooks upstairs for those in the dorm area. We'll be staying there again! Julyn, thank you so much for coming to stay with us here at The Ledges. It was such an honor having you and we appreciate your valuable feedback. Please know you are welcome back here anytime! Thanks again from all of us here at The Ledges. My family and I loved staying in this rental. It’s closeness to the pool was perfect. The views from the back of the house and the front of the house were relaxing and pleasing. We loved our stay here and would definitely love to come back and would recommend highly as a place to stay in the future. Robert, We are so happy that your family and you enjoyed your time spent at The Ledges, and are happy that you chose to stay here for your trip to southern Utah. We appreciate your kind response in regards to the property, the location and the surrounding views. We can not wait to see you again in the future! Thanks again, from all of us at The Ledges. We took some of our children and their families to the Ledges for Spring Break. We had a wonderful time. Everyone enjoyed the pool and some of the biking trails. Nancy, we appreciate your kind response in regards to your stay at The Ledges and thank you for choosing to stay with us for your visit to southern Utah. We are happy to hear that you enjoyed the property as well as the amenities and surrounding areas. We hope to see you again soon! Thank you again, from all of us here at The Ledges. Excellent customer service. Clean and comfortable accommodations. Our family enjoyed all aspects of our Ledges rental. Luxurious upper porch, large rooms, quiet and peaceful. Beth, we are happy to hear that you enjoyed your stay with us at The Ledges. Thank you for your kind response in regards to the property. We hope to see you again in the future. From all of us here at The Ledges. I brought 15 student leaders from BYU down to St. George for a Reflection retreat and we stayed at The Ledges. Our experience could not have been better! We really loved the pool and pickleball facilities. The property we stayed in was nicely furnished and well-equipped. The grill worked perfectly as we bbq'd dinner next to the pool in the warm twilight o dusk...pretty perfect! Chris, thank you for your kind response in regards to your stay here at The Ledges. We are happy that you enjoyed the condo as well as the amenities. We hope to see you again in the future! Thank you again, from The Ledges. We enjoyed our stay! The location was great I enjoyed having all of the kids be able to stay in one location, I didn’t have to worry about them going to the pool it was right out side our door. The facility was very nice overall we would come again. Tammy, thank you so much for coming to stay with us here at The Ledges. It was a honor having you all and we hope you will come stay with us again for your next tournament. Please let us know if we can help in anyway. Thanks again from all of us here at The Ledges. Marsha, we are happy to hear that you enjoyed your stay with us. Thank you for your kind words about the condo and the amenities. We hope to see you sometime in the future. Thank you again, from all of us at The Ledges. Beautiful unit with a great location. It was very frustrating to be woke up every night by people in the pool. One night it was after midnight and people were in the pool laughing and keeping us up. I wish the pool hours would have been enforced. Other then that we really enjoyed our stay here. Robert, thank you so much for your feedback about the property and the amenities. We will take note of it. :) Thank you again for staying with us, from all of us at The Ledges. We have gathered as a family to bring in the New Year for the past fourteen years. We look forward to renting from the Ledges in the years to come. Norman, thank you for choosing us as a gathering place for your family. What an honor it was having you all stay! Dan, our property manager, mentioned how nice you all were and so easy to work with. We look forward to having you back and making The Ledges, your home away from home. Happy New Year from all of us here at The Ledges. The house and community came with just the right amenities. The mountain views were spectacular (sunrise to sunset). It was the right distance away from the main town. We were able to fit 2 families more than comfortably. We would definitely love to come back. Diana, thank you so much for coming to stay with us here at The Ledges. It was an absolute pleasure having you all and so happy to hear that this beautiful vacation rental fit your two families just right. Please know you are welcome back here anytime! Happy New Year! Location is perfect. Loved the floorplan. We will definitely be back! Thank you so much for coming to stay with us here at The Ledges. It was absolute honor having you all, and please know you are welcome back here anytime. We also appreciate your honest feedback of this vacation rental. We hope to see you again soon :) Thank you again from all of us here at The Ledges. This place is Awesome! Loved it! Stayed with 16 family members what an great house! Very Clean and right next to the Pool! We did not want to leave! This home has everything you need top of the top! Property Manager Dan Dekker made everything so easy and he made sure everything was perfect for us! We will definitely be back! Thank You Dan! Angie it was an absolute pleasure having you all stay! What a special event you had for your son and we feel blessed to have been a place to house your family. Thank you for coming to stay and we will let our Property Manager, Dan Dekker, know your thoughts about your experience. We appreciate your honest feedback and want you to know you are welcome back here anytime! If you need anything, we are a phone call away, Thank you from all of us here at The Ledges. 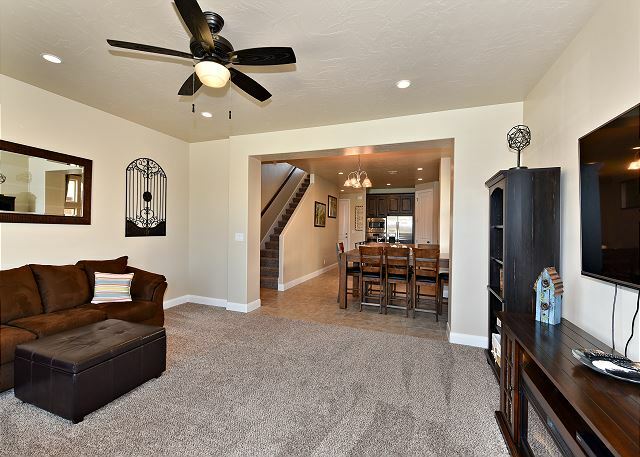 Wonderful, clean, and new townhome. Beautifully decorated. Slept 9 of us perfectly with room to spare. 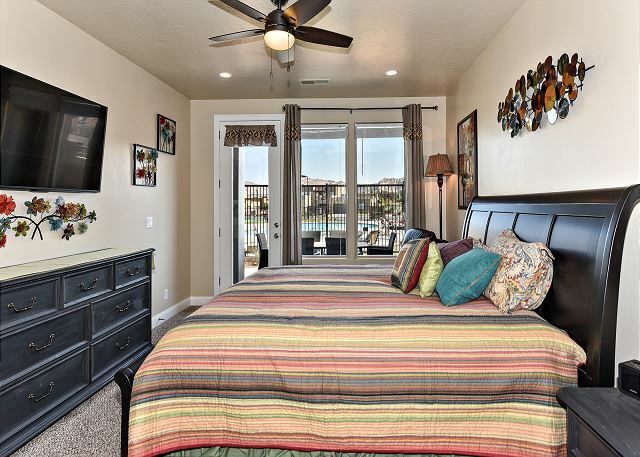 All bedrooms have TVs plus 2 more TVs in family and living rooms. Loved the outside decks. Right by the heated pool. Management company easy to work with. Will definitely come again! Victor and family.. Thanks so much for coming to stay with us here at The Ledges. It was an honor having you and we appreciate your honest feedback. 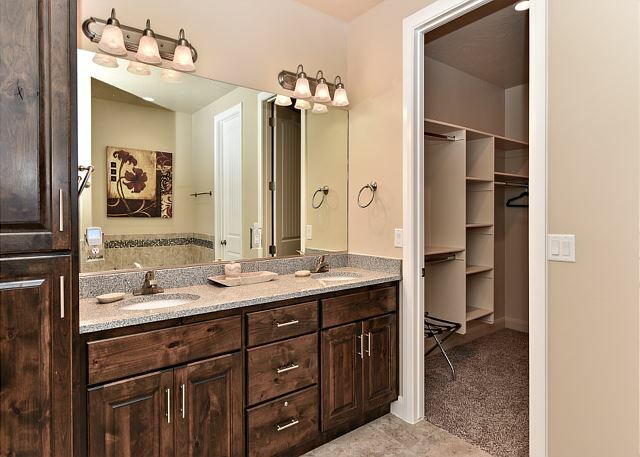 We are happy to hear you enjoyed this beautiful home and the many amenities offered here at The Ledges. Please know you are welcome back here anytime! Thank you again from all of us here at The Ledges. 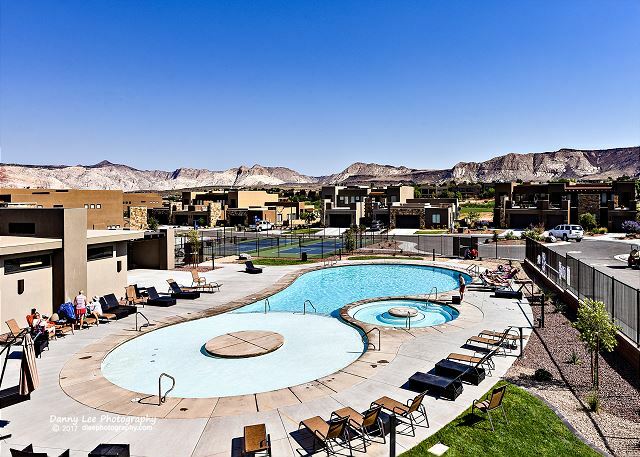 This place is rated "Best of Best" because it was very clean, very roomy, pool next to condo, closer to St George and Diamond Valley, and up on the hills away from busy traffic. Thank you for allowing my FAMILY to be a part of your community. We loved it!!!! Thank you so much for the great feedback! We appreciate you all coming to stay and providing honest feedback as to how close the state parks are, and away from the hussle and bussle of the city. We truly appreciate you all coming out and please know you are welcome back here anytime! Best regards from all of us here at The Ledges.